The Boston Ballet, led by its Artistic Director Mikko Nissinen pulled out all the stops for the 50th Anniversary Season at the David H. Koch in New York City’s Lincoln Center. Mr Nissinen presented a company rich with tradition, talent and vision. The company’s 50th Anniversary Season offered two exciting programs and as an added treat, live music was provided by the Boston Symphony Orchestra. Altan Dugurra gave an honest and intriguing performance as the faun in Vaslav Nijinsky’s Afternoon of a Faun. 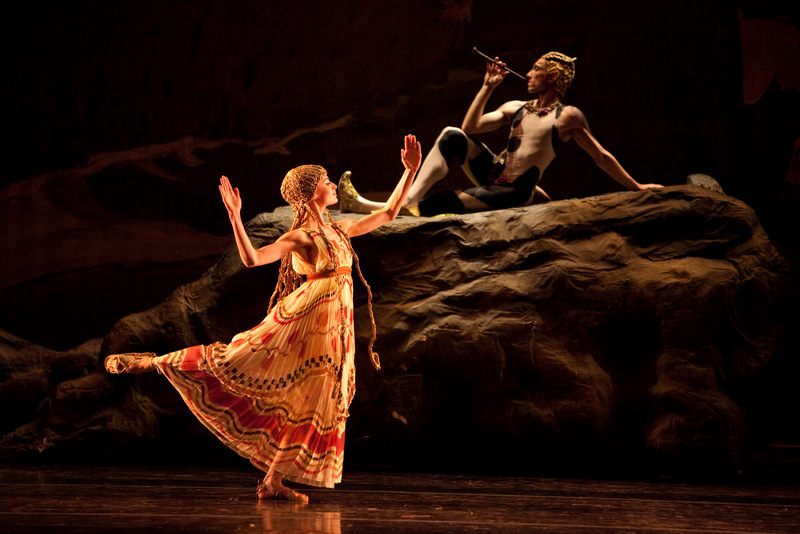 As the curtain rose you witnessed the beauty of Russian painter Leon Bakst’s original costumes and sets. That moment when the oboe is heard at the beginning of Claude Debussy’s Prélude à l’après–midi d’un faune, the Boston Symphony Orchestra captivated us all. Seeing Vaslav Nijinsky’s original choreography you recognize just how revolutionary was the work. With the body always in profile, feet turned in, Nijinsky’s staging was intentionally to the imagery found on ancient Greek vase paintings. All though the company also has Jerome Robbins’ version in its repertory I am glad that this was the one selected to be shown. During Finnish choreographer Jorma Elo’s Plan to B you eyed followed Whitney Jensen whenever she was on stage. She dances with such crisp technique combined with an inner fire that watching her you knew you were in the presence of an artist at the height of her powers. Mr. Elo has been Boston Ballet’s resident choreographer since 2005 and his choreography tends to be fast paced and highly athletic. Plan to B, set to the Baroque music of Heinrich von Biber is an extreme abstract work in regards to the use of the body in space. 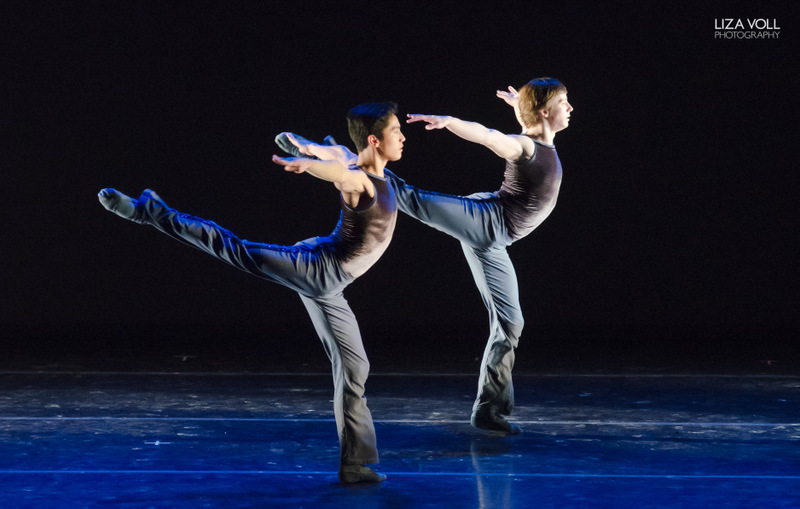 The choreography is ripe with classical movement interspersed with contemporary elements, limbs fold at sharp angles and unique movement phrases highlight the work. It is intensely musical, the body and the score seem to meld into a singular vision. In William Forsythe’s The Second Detail stillness is a vital as motion, abstract, dramatic and challenging, it is work of great daring and intelligence. The saccadic rhythm of Thorn Willems score drives the dancers through every move, every step. The movement vocabulary is without a doubt classical, tendu’s and port du bras are everywhere, but it is studded with repetitive off-kilter moves, the body tilting and/or the torso used in a sometimes awkward rubbery manner. The dancers settle on benches that line the back of the stage, two will sit and stare straight head while four others move in unison slightly off to their left. Again stillness is as important as movement in the piece where a dancer or dancers will momentarily stop, breath, and then begins to move once more. The work is composed of group pieces, duets, trios and sudden solos. On one side of the stage three may be moving in unison while on the other side an intricate solo is being performed. This solo may stop, the dancer choosing to move to the back to sit down or it may evolve into a duet or trio with other dancers joining the first. Walking on, off and about the stage gives a pedestrian feel, a feel that makes it seem current and of the moment. A dancer may dazzle us with an intricate solo of leaps and turns only to suddenly stop and simple walk nonchalantly away. The work ends when one dancer kicks over the sign labeled “THE”. The fact that you must be a skilled technician to even attempt Forsythe’s choreography is an understatement. The fact that the dancers of the Boston Ballet can tackle it and other choreographers whose work is just as complex and intricate is a statement to their talent and training. « Fire Island Dance Festival | July 18-20, 2014 at Fire Island Pines, NY….